I have found drawing to be indispensable to good planning and good collaboration – the top two critical skills for success in life. Drawing – not just the artistic kind, but the doodling kind that we all know how to do – helps you think and get clarity. In 12 Drawings I share how you can learn and use 12 drawings I have used in my adventures in business and technology, as well as in my own personal contemplation and planning of my life. I have used these drawings to help teams and individuals gain clarity and insight to companies, project teams, and individuals, including myself. These drawings are thinking exercises that help you focus on what is pivotal in the projects you are planning. These simple drawings can be drawn by hand. To help you learn them, they are shown as line drawings. But they are designed to be quickly drawn by hand – by anyone. Even if you can’t draw a straight line. Think of it as doodling your way to enlightenment! Life seems to follow a cycle of taking in, processing, and giving out: Inhale, process, exhale. Inhaling means taking in things that hopefully nurture, inspire or educate you. Processing means thinking, prioritizing, deciding what things mean, and coming to your own conclusions. 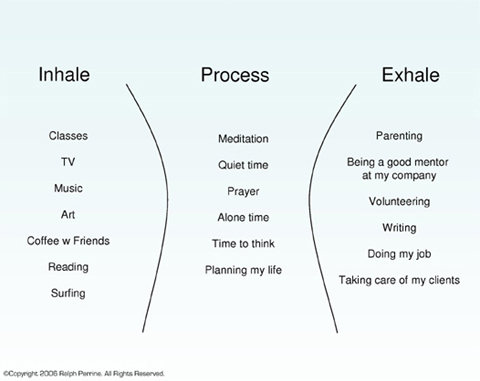 Exhaling is output. What you produce, write, create. Your work, your contributions. It seems that these three activities – inhaling, processing, exhaling – have to remain in balance with each other. When these elements get out of balance life becomes frustrating. If you are taking in all the time but never giving out, or there’s giving with no taking in, or no time to process life – all of these are examples of being out of balance. When you need to regain your equilibrium and plan a more balanced life. Under INHALE, list the things you take in…what nurtures and re-energizes you. Good books, certain people, sunsets, etc. What teaches you and gives you oxygen. Under PROCESS, list the activities that let you think, gain clarity and process things. Are these 3 activities in balance? If not, what needs to change? The Critical Path drawing helps you think through a sequence of important items you must navigate through in order to reach an objective. Do this exercise with a group to spot risks or issues ahead of time. It is a great tool for discussing likely scenarios or decisions that may become necessary. The Critical Path always frames the discussion in the context of a set of long term objectives. This helps keep your thinking process on track. 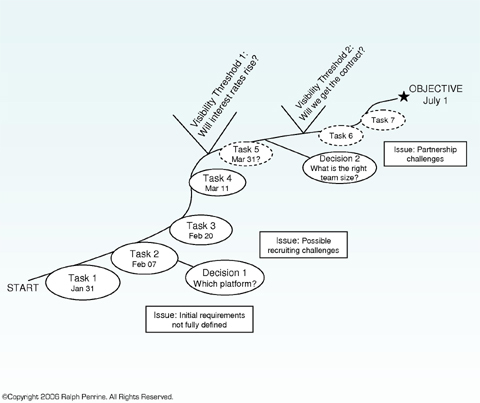 Use the Critical Path drawing regularly to plan (and track) your path toward personal or business objectives. Revisit earlier Critical Path drawings to measure your progress and compare your plans with what actually took place. Draw a straight or wavy line that illustrates the path to your objective. Along this path, draw ovals at the points where specific tasks or decisions are necessary. Write the name of the task or decision inside each oval. Draw rectangles along the path which represent issues you might have to deal with. What issues are likely to arise, given the nature of the task, the people we are working with, etc.? At certain points you may want to draw a large “V” to represent a Visibility Threshold – a point where you gain insight or knowledge you previously did not have. This new knowledge may require you to change direction, or it may allow you to make a more informed decision. 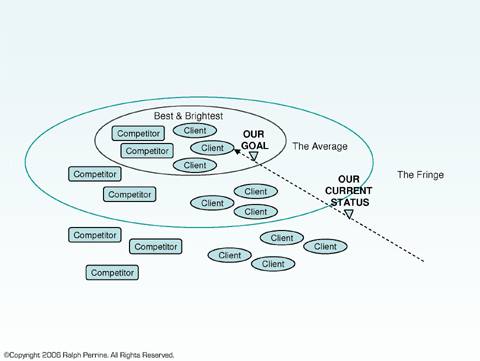 The Bright Core drawing helps you think about your “playing field.” Where you are in relation to competitors, vs. where you want to be. But it doesn’t just apply to business. It can help in assessing any situation where there are competitors and opportunities to improve your game. This drawing uses the analogy of a solar system to categorize the players in your playing field. In the bright core, there are the best and brightest. The best competitors, best customers, best vendors, and the best rewards. The average players live in the middle zone. The weakest players languish out in the dark fringe. Use the Bright Core drawing to plan your path to excellence. It will help you select employers, clients and partners, and determine who you want to learn from and emulate. Draw a circle in the middle of the paper. Inside this circle write the names of the best and brightest. Draw a larger circle around the inner circle. Put the average players in this circle. List below average players outside this circle. Draw a line from the outside to the innermost circle. On this line, mark your current position, and your desired position. Key Questions: Is my social network, or my business development network in good alignment with my interests or my goals for excelling in my field? What do I need to do, to move toward the Bright Core? These drawings are excerpted from the monthly calendar 12 Drawings that will change your Life, a 12 month calendar by Ralph Perrine. Each month the calendar presents you with a new drawing. It shows you how to draw it and what you gain from it. By the end of the year you will have a new vocabulary – a visual vocabulary that empowers you to think, plan and navigate through life on a whole new level. Some of these drawings have practical applications in business. Some will help you communicate and present your ideas more effectively. All of them will help you gain personal clarity and direction for your life. They may look like ordinary doodles, but they are actually navigation tools. These drawings are powerful because they are more than drawings…they are mental exercises. They teach you new ways to think about your life. It is not a stretch to say that the mastery and constant practice of these simple drawings will take you to the life you want to have. Ralph Perrine is the author of America 2076: Pop Technology and the New Future of Democracy and other works.